The Marlboro Man is an iconic symbol of American Marketing and Brand Management. The ‘Marlboro Cowboy’ is one of the most brilliant advertisements ever made in history. The Marlboro Man conveys freedom, attitude, charm, and masculinity. 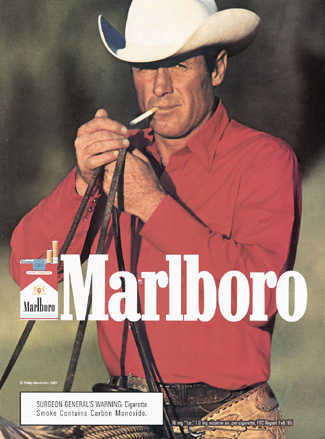 He is the cowboy of the world and his allure helped Marlboro outsell its competitors by almost three times. But, as we all know, it is not easy to remain at the top. Marlboro started to feel pressure from Camel, Chesterfield, and other bargaining brands. On April 2, 1993, Marlboro announced that it would cut the prices by 20 percent. This day is popularly called ‘Marlboro Friday’ in the marketing world. Marlboro Friday is considered to be one of the most important case studies for business school graduates around the world. It is used to teach business school graduates the significance of price discounts, price wars, profit maximization, co-operating with competitors and the evolution of branding. People in the business circles believe ‘Marlboro Friday’ changed the dynamics of Consumer Marketing forever. What happened that Friday ? The Marlboro Man is considered invincible and demanded a premium price for his brand of cigarettes. But with increased competition, Marlboro announced a heavy price-cut to compete on price. This made people feel that if the Marlboro Man cannot sustain by demanding a premium price in the market, then no other premium brand in the world can sustain. So, alongside the stock of Marlboro, the stock of other premium brands like Coca-Cola, Disney, P&G and other companies fell marking the death of premium price. People took the case of ‘Marlboro Friday’ and said that consumers will always get attracted to the better priced products and will not pay premium price for any brand. But thank goodness, people are still paying for the premium brands such as Apple and Starbucks. So, what has changed in consumerism? What has changed is the very definition of branding. Branding is no more just about outsourcing to another advertising company and putting up your billboard. Branding has become a key strategy in business. Branding has evolved from just advertising to the whole end to end experience. It is what your customers feel when they go to the store, it is the feeling that they buy, it is how the product talks to the customer, it is how the product talks to the competitor, and it gives your consumers an identity in the society. Hi Krishna, I’m glad you found my blog, and we’re now connected! Courtesy of The Marlboro Man!! ha.. ha..
Let’s stay in touch. It’s clear that we’re interested in the same area of Branding, Innovation, Consumer/Human Behavior and Communications. Are you based in India? BTW, how is Marlboro performing there? Is it also the leading int’l cigarette brand? Half of me hails from Indonesia so I’m familiar about the tobacco market there, and Marlboro is THE number int’l cig brand BY FAR!!! Although the vast majority of smokers prefer the local “KRETEK” (clove cigarettes). Dian, good to meet you. Thanks to the Marlboro Man. Yes, I am from India. In India, Indian Tobacco Company (ITC) is the leading tobacco company. Hi Krishna, good to hear back from you. BTW, what do you do? You must certainly be in the areas related to either mktg, communications, brand strategy, business development, or academics. I’m a brand strategist with Mindcode (www.mindcode.com), a US-based co that specializes in the Hispanic Market providing the services of Innovation, Brand Strategy & Consumer Behavior. The past year I’ve been busy trying to expand to Asia, via Indonesia. We’ve secured our first client, and – you’ve probably guessed it – it’s Philip Morris. And yes, the red top box is the best seller in Indo too. We’re also helping Philip Morris Indo on their Kretek (clove) cigarette brand: A-Mild, which is the leading cig in that category. I know India’s booming, and opportunities (to rethink how companies do biz, via the “Brand Strategy” route) abound! Maybe if we continue brainstorming for ideas, it’ll get us somewhere!! ha.. ha.. I would not assume I’ve ever seen a new blog with this lots of remarks into it! Awesome write-up, well written I must say.